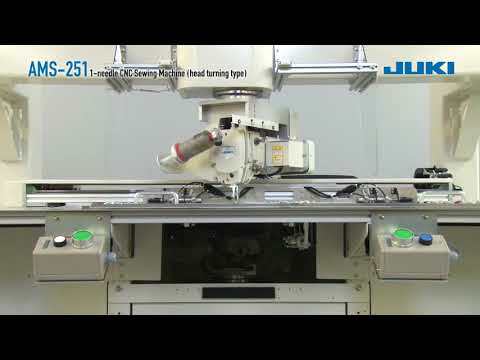 JUKI has launched the AMS-251, a high-end 1-needle CNC sewing machine provided with a machine-head-turning mechanism. The new model guarantees high-quality seams uniformly in every sewing direction. - JUKI unique synchronisation technology guarantees stable control of the machine head, hook and feed mechanism, thereby creating the most favourable seams. With its sewing area of “1,000mm x 600 mm” the AMS-251 is best suited to the sewing of decorative stitches and large-size products. - The AMS-251 is ideally suited to the sewing of decorative stitches on car seats and luxury bag as well as airbags and other large-size products with zero design tolerance for irregular stitching. Slip ring system has been adopted to the new machine-head turning mechanism. As a result, the limitless turning of the machine head is enabled to allow the sewing machine to sew complicated patterns continuously. Since thick materials, clamps, palettes with protrusions can be used, the design will be expanded. Adoption of the 3-fold hook reduces the frequency of bobbin replacement even when a thick thread is used, thereby supporting sewing of large products. The IP420 for the existing AMS Series models has been adopted for the new AMS model. In addition, the existing sewing pattern input software “PM1” is also applicable. Opening and closing sensor is mounted to the turning-head cover and turning-hook cover to prevent the machine from starting when the cover(s) is opening and to automatically stop the machine if the cover(s) is opened while the machine is in operation. A 2-handed start button has been adopted for safe, accurate startup. In addition, unintentional start-up of the machine is prevented. Bobbin can be changed easily by opening the access cover without requiring the operator to reach under the machine to change the bobbin.